If you want exotic and unique plants for the summer, then look no further than summer-blooming bulbs. They are planted during the spring and offer interesting textures and colors all summer long. Listed below are four key things to know if you want to plant some summer blooming bulbs! Summer blooming bulbs can be purchased from many different places, but your largest selection will be online. Brent and Becky’s Bulbs offer a wide selection and is where Green Bay Botanical Garden orders many of our summer bulbs. The Garden is also a registered nonprofit with Brent and Becky’s. By shopping through their fundraising website, you can ensure a portion of your purchase supports the Garden! When purchasing bulbs online, buy from a reputable seller and read reviews of each type of bulb to double check that it will fit your requirements for your garden. If you’d rather purchase in-store, looking through plant catalogs such as Jung Seed and Park Seed, is another great option to buy a wide variety of summer blooming bulbs. Yet another option is big box stores and local greenhouses, which typically carry a limited selection of summer-blooming bulbs. In the Green Bay area, Stein’s Garden and Gifts and Schroeder’s Flowers have nice selections, some of which you can purchase already growing in pots ready to plant! Here at the Garden, elephant ears (Alocasia and Colocasia), dahlia (Dahlia) and canna lilies (Canna), perform well for us – we’re in USDA zone 4b to 5a. Elephant ears grow to colossal sizes, reaching heights of four to five feet tall and four to six feet wide! They offer a bold texture in your garden and do wonderfully as barriers, edges or as a statement plant. Elephant ears can tolerate full sun conditions but will benefit from a little bit of shade, especially in the afternoon. Wherever you plant them, make sure you give them a lot of space to grow. Plant the tubers two to three feet below the soil surface with the blunt side of the tuber down. 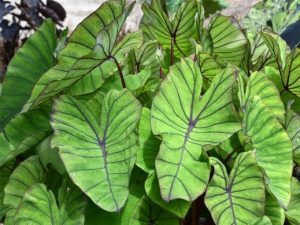 Some popular cultivars of elephant ears are Blue Hawaii, Nancy’s Revenge and Borneo Giant. 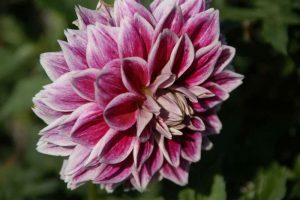 Another popular summer-blooming bulb is the dahlia and there are thousands of varieties to choose from. 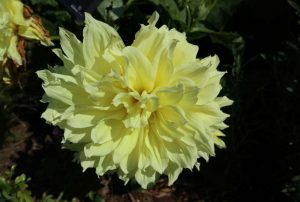 Dahlias enjoy full sun and will grow about two and a half feet tall, some even larger! Most dahlias benefit from staking, as their flower heads become heavy and have a tendency to flop over, especially after rain. When it comes to planting dahlias, there are some key things to know. Be sure to plant the bulbs six to eight inches deep and that the growing point (eyes) of the bulb is pointing upwards. A few popular dahlias are Kelvin Floodlight, Dark Angel Dracula and Myrtles Folly. The last must-have summer blooming bulbs on our list are canna lilies. They like full sun and will grow up to five feet tall and two feet wide. Their large leaves catch your eye and their brightly colored flowers are like cherries on top. Canna lily flowers come in many shades of pink, red, orange and white. Some varieties even have contrasting multi-colored leaves or deep bronze or emerald colored leaves. 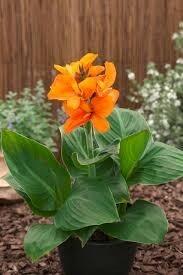 When planting canna lilies, ensure they are four to six inches deep and two feet apart. Here at the Garden, our favorite cannas are the South Pacific™ series (grown from seed), Pretoria and Tropicanna. Once the bulbs are planted, they will grow quickly and require some care. 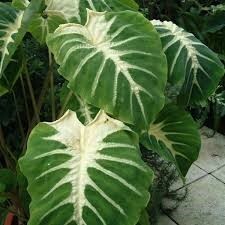 Elephant ears may need some pruning to remove large, faded leaves. Remember to use garden gloves when pruning back elephant ears as their sap can cause irritation of the skin and eyes. As for dahlias, routine deadheading is necessary to promote repeat flowering throughout the season. Be sure to continually stake these plants so their gorgeous flowers can be displayed in all their glory! As far as canna lilies, deadhead spent flowers and flower stalks, as well as any leaves that may become discolored and faded. Once the temperatures begin to dip down into the low fifties, it’s time to start thinking about what to do with your summer blooming bulbs. Since they cannot survive freezing temperatures, you’ll have to decide if you want to overwinter them or treat them like annuals and add them to your compost pile at the end of the season. To overwinter any of these bulbs, you will want to dig them out of the ground before the first frost and store them in a heated garage or basement. For elephant ears, prune off all the foliage. Next, dig up the tubers and root mass, allowing as much soil to remain on the roots as possible. Bring them into your garage and let them dry out for a week or so, doing this decreases the chances of rot over winter. Once they are dry, place the root mass and soil in a plastic garbage bag and let them rest for the winter. For dahlias and canna lilies, cut back the foliage to within a few inches above the surface of the soil (this helps you remember which end is up). Gently dig up the tubers, leaving as much soil on them as possible. Place the tubers in brown paper bags and cover with dampened peat moss, to help keep the tubers hydrated over the winter. Once spring rolls around it is time to think about your summer blooming bulbs again. You can simply plant them directly in the ground like you did the previous year, but you will need to wait until the soil warms up and all danger of frost has passed. At the Garden, this is typically after Memorial Day. If you want to give your bulbs a jump start to the growing season, start waking them up in late March to early April. Remove the bulbs from their bags and plant them in pots using potting soil. Water the bulbs and place in front of a bright window or under supplemental lighting, in a warm location. Within a few weeks, you should see new foliage emerge. Plant out in your garden once all danger of frost has passed. Summer bulbs offer unusual and somewhat bizarre features, whether it be leaf shape (elephant ears), leaf color (canna lily) or bloom color (dahlia). These plants can be dug up each year and reused in different areas, offering a new design element to your landscape. Most summer blooming bulbs offer many varieties to choose from, which makes your garden beds pop with color. Summer blooming bulbs are also very easy to find, whether at local greenhouses, in catalogs or online. The options are endless and they never go out of style, so try out a few summer bulbs in your garden this year! Are you ready to get into your garden? Join us for Vegetable Gardening for Beginners on Wednesday, April 24 from 6-7:30 pm. Remember to save the date for Garden Fair! It’s making its return on Friday, May 31 and Saturday, June 1, and we’ll have a variety of plant professionals on hand for you to stop and ask your gardening questions.